I just got back from Naples, where I had a truly amazing Pizza Margherita from the famed restaurant, Da Michele. I wrote about it on my blog -- it was so simple, and yet really something special. 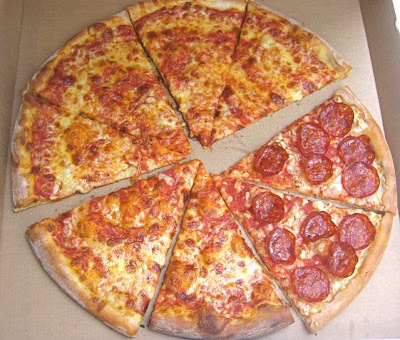 That said, I grew up eating New York-style pizzas. And while I can respect and, occasionally, enjoy something different, I'll never love another pizza as I do my home slice. Much has been written about pizzas in this town. The Prague Post used to have annual best pizza contests. 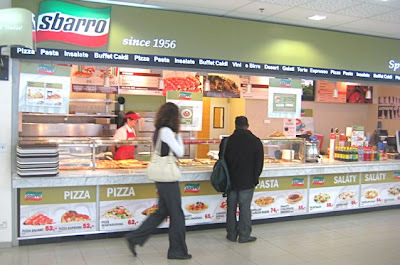 So, I was surprised to find little has been said about Sbarro, which has been in Prague for a few years now. I'm not really sure why I'd never been to the one in Prague before. 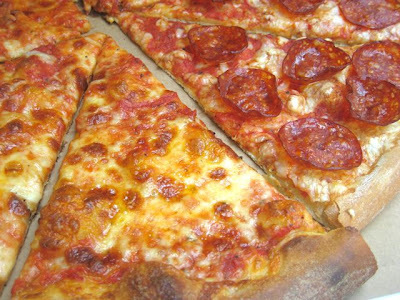 This was a natural for me -- a chain that started in New York and makes New York-style pizza. 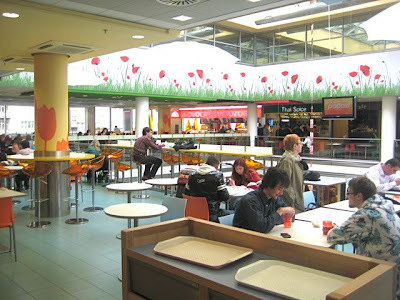 I went to the food court at Palac Flora to check it out. 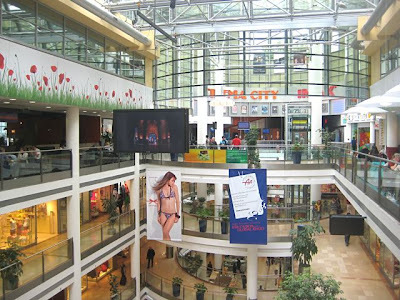 The mall also has McDonald's, KFC, and a variety of quasi-Asian options. It's worth a trip to the bottom level to check out the French patisserie, Paul. 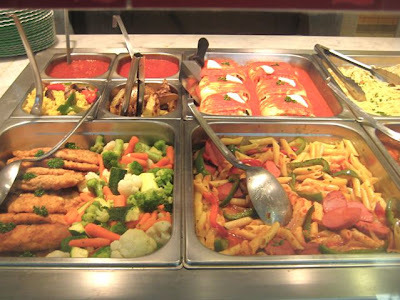 Sbarro's serves a number of other kinds of food besides pizza such as pasta, meats, and vegetables. But I had no interest in those. They didn't look nearly as appetizing as what you'd find at an American Sbarro. They did have a pizza man working out front for the customers to watch. But he's not always out there. A good number of regular pies had already been pre-made and awaited reheating. They also had a number of thick-crust and "stuffed" pizzas filled with meat or vegetables, with a crust folded over the top. I had a specific mission in mind. I told the girl behind the counter I wanted a whole pizza to take back to my office. Her eyes grew wide. "A whole one?" she asked. "I have to ask." It seemed this had never been done before. Permission was secured and a large box was found. It was 29 CZK per cheese slice and 39 CZK per pepperoni slice. I got two pepperoni for myself because they didn't have enough cheese slices prepared. The total was 252 CZK. Back at the office, the response was generally positive. But in the 15 minutes it took me to get there, the pizza had lost almost all of its warmth. One person liked the generous amount of cheese. 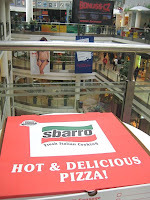 Another, an American, admitted being a huge Sbarro fan and said he went as soon as they opened. He still goes regularly. One colleague compared it Domino's. This pizza had potential, the sauce and cheese were pretty good, but it suffered on one major count. I've tried it a few times now, and the crust has always been stale from sitting too long. That really killed it for me. If freshly made, it could be so much better, but I've never had that. In fact, they always seemed to have been sitting around a long time. Before leaving, I asked the manager if I could have their telephone number so I could call ahead and place an order for pick up. "No, that's not possible," I was informed. Another strange and unusual request, it seemed. On another visit, I tried a slice of the stuffed pizza with meat (77 CZK). I liked this the best. It was full of tomato sauce, sausage, pepperoni, and very bready sliced meatballs. Tasty, substantial, and filling. My last time there, I tried their thick-crust pizza with ham and mushroom (62 CZK). 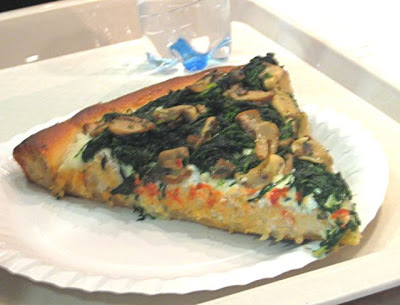 I also stole a somewhat blurry shot of someone else's tray with a thick-crust spinach and mushroom pizza. Maybe it is the closest thing to pan pizza in this town. I didn't really like mine. The toppings, cheese, and sauce were fine, but the counter girl failed to heat it properly. It was hot on the outer edges and cold in the middle. Also, the crust was just too thick and bread-like and the topping didn't penetrate down into it. Proper heating might have done the trick, but it just didn't happen. Call me crazy, but my favorite and most New York-like pizza in Prague is from Pizza Grosso, the small hole-in-the-wall in the nasty passage behind the National Museum. Only 30 CZK for a quarter of a pizza, with often a great, crispy crust on reheating and a well-seasoned sauce. From some night owls, I've heard claims that Pizza Roma at I.P. Pavlova is better. But I don't buy it. Places like Rugantino's can be OK, but it's just too European for me. My brain was imprinted from an early age to fly in New York pizza formation. There's little I can do about it now. 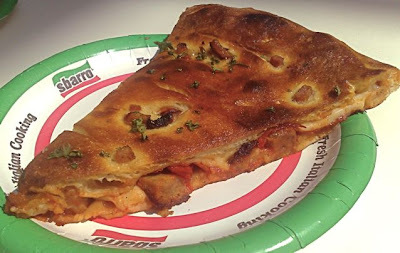 My feeling about the Sbarro at Flora is one of great disappointment. With proper preparation and attention to detail, it could be quite good. But after watching the careless way they run it, I have a strong feeling it will never live up to its potential. So, next time I'm at Flora, maybe I'll be hungry enough for just one slice. Just in case they've figured out how to do it right. My nearest pizza place is in Masarykovo Namesti, they do a mean chicken tandoori pizza, when you order a whole one you get a free 1 litre bottle of soda - total cost 240kc. Having said that it is good to go into the dive pub next door and pick up a couple of bottles of Regent to put in the fridge. Usually you get the idea of the restaurant no matter what you choose. This time I believe you missed the main point of Sbarro when ordering pizza. You order anything else, the server places a plate on the scales, adds some rice/noodles, then takes 2-3 away so you don't get 0.0001 more gram of the cheap stuff. Then you proceed to the cashier and they check what you have and give you your own plastic fork and knive. You cannot take it yourself as usual because you are a potential thief and want to take two spoons home. 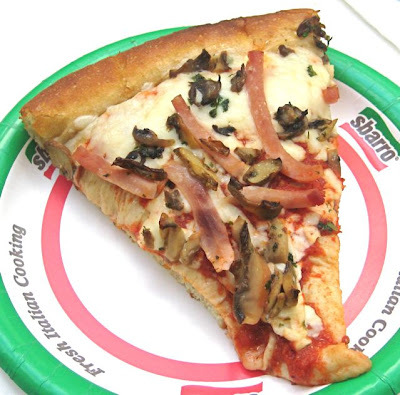 Sbarro is so annoying that it does not matter what they serve. I'm not sure I missed that point -- I was just ignoring it. I only cared about the pizza. I thought about reviewing that other stuff, but none of it appealed to me, so I didn't. I was actually there today and saw the scene you describe for the first time -- a plate on the scale and removing two tortellini with tongs to get the weight right. Crazy. 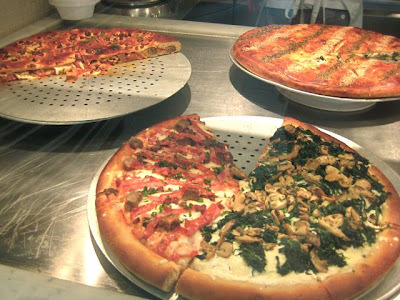 I went again because a Sbarro lover told me that pizza is much better when ordered fresh and only takes 15 minutes. However, it took 25 mins. It was better, but still not great. Colleagues said the Supreme Pizza with lots of toppings was bland. It thought the crust was still not crisp enough. I think some people just don't "Get" Brewsta's reviews. Brewsta is a non-pretentious food reviewer. He reviews what he likes to eat, and that's not a crime. He reviews plenty of expensive haughty restaurants. He reviews Burger King and pizza places in shopping malls. Ask yourself: Why does he review these places? My guess: because he likes to eat good food. And good food, especially in Prague, is a real quest. If Brewsta says Sbarro is disappointing and the service is bad and unimaginative, I believe him. I'm glad Brewsta is on the quest; he makes my dining experiences in Prague more enjoyable. there is a new teeny pizza place not far from Tylovo Namesti just waiting for your review. It's at the corner between Belehradska and Koupkova. Absolutely no room inside but they have a real pizza oven and the make your pizza pronto as you order it. The name is Pizza Sicilia. >>>No, they didn't pay me, just wondering what you would think of it. I know the place you are talking about at Tylovo. It replaced the Bohemia Bagel Express -- which I was sorry to see disappear. Based on your recommendation, if I'm in the area, I'll give it a try. >>>I was also sorry to see BB moving out, fortunately I live next to the shop in holesovice.... but it's not the same. Next time you're in Flora, check out the Orange Moon take-away. It's the best short order food in Prague. Same cooks as for the sit-down version of the restaurant, but you're paying only 120kc for a meal, and it's excellent. Strongly recommend the 11 or 12 curries. Will definitely try Orange Moon at Flora. I'm around there more often these days. Not sure I'll blog it, though -- people will think I have a Flora fixation. Will probably give a quick reax on Twitter some day. If you want a decent pizza in Prague go to one of the many italian restaurant owned by italians. 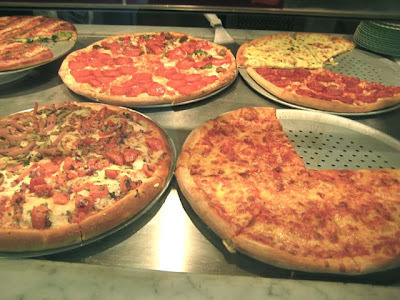 I'm pretty sure you'll like a REAL italian pizza than pizza made by people of other nationalities. Be sure they'll have a wood oven, this could ensure high calories in cooking, and be sure they'll use mozzarella and italian ham and pepperoni (italian ham is sliced into wide , thin sheets of meat). 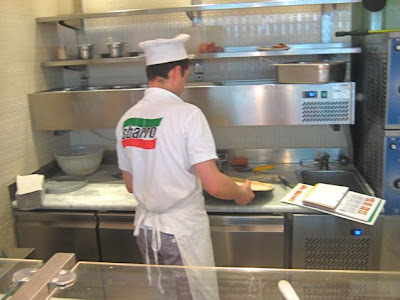 I can eat something like sbarro (I've tried it out in Istanbul) only if I am really hungry and I do not have so much time (e.g. when I'm on travel).